Composer Oliver Lake and performer Molly Sue McDonald. An artistic collaboration can stretch artists to try new things, while allowing them to build on of each other's talents. A new production at Pillsbury House Theater in Minneapolis is the result of a collaboration between a theater, a playwright, a composer and performers. Such projects can have both their advantages and their disadvantages. Minneapolis, Minn. — All theater productions are by their very nature collaborations, but writer and director Carlyle Brown's latest work, "Talking Masks," seems to go further than most. It tells the story of six women in six vignettes. He worked on the scripts with actor Louise Smith, who plays all the main characters. Brown says he was excited about the material, but he wanted to do something special to bridge the gap between each story. "Everyone's seen these plays where we watch stage hands move the furniture in the dark," says Brown. "I like to call them 'the acme moving company's production of Between the Scenes.' We wanted those scene changes to be interesting." Brown took his show to Pillsbury House Theater. It produces a few plays in its space in Minneapolis each year.Co-Artistic Managing Director Noelle Raymond says in order to keep from going dark for long periods of time, Pillsbury collaborates with other theater companies in town that don't have their own space. "It simultaneously allows Pillsbury to produce more work, maintain relationships with artists in the community, and to explore new ways of creating work," says Raymond. So a second collaboration was born. Then, as luck would have it, nationally reknowned jazz composer and performer Oliver Lake was in town on a McKnight Foundation Fellowship. He approached Pillsbury House Theater looking for a residency. Carlyle Brown suddenly had a composer at his disposal to work on bridging the six vignettes with original music. 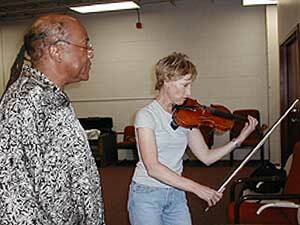 Oliver Lake goes over the music with Molly Sue McDonald. Before each scene, McDonald stands to the side of the stage and performs a piece that sets the tone for the story to follow. McDonald says she's used to singing and acting on stage, but it's rare that she plays her violin. This project is stretching her in new ways, which makes her nervous. She's trying to think of it as another acting job. "It's another character in the play," says McDonald. "It's transitioning from one part of the play to the next and I'm interested in seeing what drama that brings, dramatically, working in a musical sense." Collaborations allow artists to pool their resources. But collaborations also impose limitations. Oliver Lake is a world-renowned composer, saxophonist, flautist and bandleader. He is a co-founder of the internationally acclaimed World Saxophone Quartet. Yet while Oliver Lake may be composing the music for the production, that doesn't mean he gets to decide how it sounds. "No, it wasn't like that at all," Lake laughs. "It was talking to Carlyle and Carlyle saying 'It's gonna be a violin.' And actually we started off with two musicians; acoustic upright base and violin. So I originally wrote it for two instruments and then later he decided he wanted it to be one instrument, but he wanted it to sound the same way. I said that's not possible!" But sometimes limitations force artists to try new ideas that work even better. Writer and Director Carlyle Brown eliminated the bass player for financial reasons. He later realized that it made more sense for the music that bridges these scenes about six different women to be performed by a single woman. Brown says he's particularly appreciative of the opportunity to work with both Oliver Lake and Pillsbury House Theater. He says working with like minded people speeds up the rehearsal process. And he says working with people he respects drives him to do better. "I wake up usually about 3 or 4 times in the middle of the night wishing I was never born," says Brown. "But you know on the whole it's been a very fulfilling experience in ways which I still have to process. I mean just working as an artist with these people is what one imagined working as an artist is about. I'm just as happy as a rat in a cheese factory!" Talking Masks runs through May 29th at Pillsbury House Theater in Minneapolis.